It's a time of regrowth in the old urban center, and the hippest and best beer crafters have gathered both hops and hopes in building the best brewery in the city. It won't be an easy task, as players compete for precious resources such as malt, yeast, fruit and spices in the local markets, all while managing and optimizing their growing bottling empires. 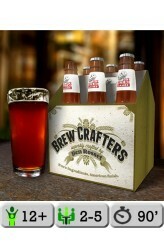 In Brew Crafters, players assume management of a local craft brewery, working hard to manage resources, use their workers wisely, and develop their brewing line to create the best local brews. Brew Crafters honors the tradition of classic Eurogames such as Agricola and Puerto Rico, but at its heart beats a unique brewery processing system that must be constantly improved, monitored, and manned in order to keep the beloved beverages.. In The Great Heartland Hauling Co. (originally announced as Over the Road), players take on the role of medium haul Midwest truck drivers doing their best to make a living by hauling goods for big suppliers. Players truck to various locations around America's Heartland, picking up and dropping off goods using matching cards from their hands. Most locations have native goods that require fewer cards to load; other locations may pay a premium for those goods but may also require more fuel – and time – to get there with the cargo. With limited space in each trailer and only five cards in hand at a time, players will have to expertly manage their resources, as well as play the odds and press their luck to be the best trucker on the road. 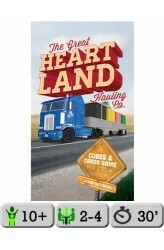 The Great Heartland Hauling Co. offers a lot of r..
An expansion for The Great Heartland Hauling Co., Badlands introduces two new location cards that provide no initial products but have high demands for three products. These two special locations are placed on the outskirts of the playing area and are only playable with five players using the included fifth set of player pieces. 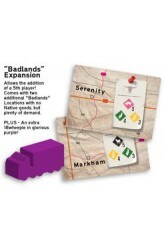 Includes: 2 Badlands location cards (Serenity, Markham) 1 wooden tracking cube 1 big rig wooden figure (purple) 1 2-part player score card (purple) 1 player aide card This is a promotional expansion initially distributed to Kickstarter backers of the main game and later distributed by Dice Hate Me Games at conventions and similar venues. https://youtu.be/ylYXGp75oKM ..